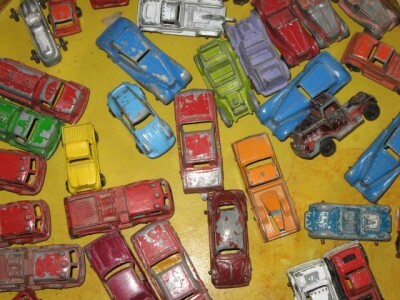 miniature vintage cars and trucks. So I bought a few…okay…a lot of them. ~ by Dawn Elliott on April 25, 2013. 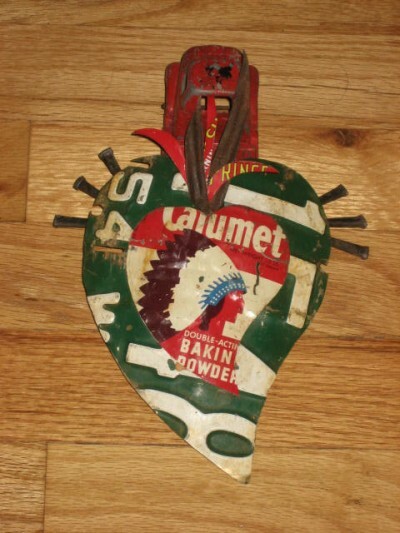 Great haiku, these blend into your art perfectly….good buy! A haiku about mini-trucks — who would have guessed it? Great finds, Dawn! 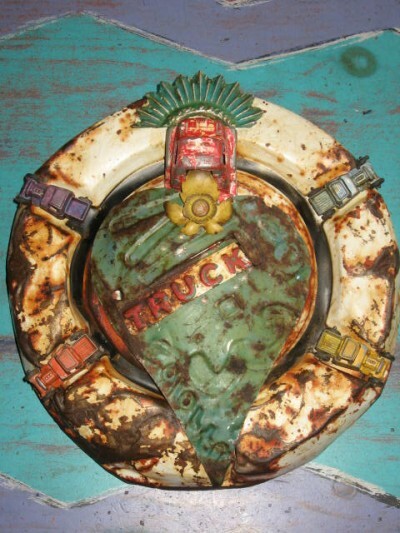 I am in oooh and aaahhh over your mini-trucks… fabulous vintage colors they have! Wowzah! Love the haiku! May all those little cars take you to amazing places! Sweet little trucks that hold many memories. Love the second line of your haiku. Great Haiku and I love those little trucks. Awesome. I love the mini cars and trucks. I played with these types of toys as a child and I’ve certainly had my share of “real” ones in adulthood too! The Haiku speaks of them like long lost friends, and as soon as I saw them, I knew them. My Grandson just got a metal detector. The first time he used it he found a Matchbox toy car. I love the connection. And the metal artwork! I have been saving the metal cans that the brand of Italian imported olive oil comes in. I needed inspiration for a project or two where I can possibly use the metal cans. I feel inspired. Just hope i can get off my motorcycle enough, now that we have warm, enough weather to ride, so I can cut the metal into something that might resemble art. Much Peace sent your way. WOW! 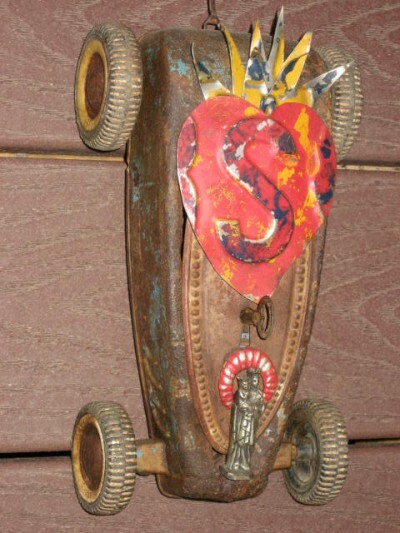 Love how you incorporated the cars into sacred hearts. They just say fun! You’ll get a lot of mileage out of this purchase! YOU DO! Oh my! Dawn, do you think I could be you for a few days? 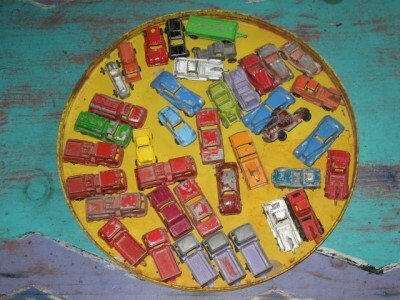 How exciting to incorporate all those many hours of joyful play with the miniature cars into your art. Infused, indeed! seriously GREAT score on the metal wonders! looking good dawn! i love swap meets. you never know. the unexpected around the corner. the toys are marvelous as is your haiku and art. I seriously love that match box sacred heart car.